Recently I was involved in a discipleship program at our church for new Christians. One of our participants had gotten caught up in the annual Easter specials that seek to erode the credibility of the Bible and argue for additions or ‘corrections’ to the historical New Testament doctrine. These television specials always quote ‘international experts’ and usually introduce little known or new material that challenges the NT canon or traditional doctrine. I’ve created a summary cheat sheet on the posts below, but I encourage you to use the links to read the original posts for yourself. This could be used as a tool by parents to discuss these points with their kids over dinner, or by anyone who wishes to firmly establish how the NT was created for him or herself. The 27 books that make up the NT canon are the earliest known Christian writings that exist and are all written within the first century AD (which makes them more reliable because eyewitnesses were still alive). Matthew, Mark, Luke, and John are the only gospels that date to the first century. Even if we are wrong with the dates of some of these documents, the vast majority of them are still the earliest documents that we possess of the early church and Jesus’ life. There are other first century writings that are not included in the canon, such as 1 Clement, but this does not take away from the fact that all the NT canon writings are first century writings. There is almost unanimity even among critical scholars to this fact. Many apocryphal writings are from the third or fourth centuries. Part of why these writings are unreliable testaments of Jesus and the early church is that some are known to be forgeries; some contain seriously fantastical embellishments or additions; and still others contain gnostic theology that only arose in the second century. The apocryphal literature that may be reliable present a consistent version of Christianity as that which is in the NT canon books. Early Christians believed that the apostles spoke for Christ after his death and resurrection (and Jesus established this truth himself (Matt 3:14-15; Matt 10:20; Matt 10:14)). This is why apocryphal books from the second century are named after the apostles in an attempt to claim authority. The apostles’ books were the ones most often read, copied, used, and revered over any others by the early Church. They became the canon. This occurs in a number of places (2 Pet 3:15-16; 2 Pet 3:2; 1 Tim 5:18). The fact that the apostles refer to each other’s work as scripture suggests that an authoritative NT canon was understood early on, rather than being a later development of the church. Irenaeus established that only four gospels were recognized by the early church in A.D. 180. The Muratorian fragment, Clement of Alexandria, and Theophilus of Antioch also established the authority of four gospels by the end of the second century. Tatian’s Diatesseron presented the harmony of the four gospels in c.170. Justin Martyr (Tatian’s mentor), c.150, refers to plural ‘gospels’ and cites from all three Synoptic Gospels, and possibly cites from the Gospel of John as well. This fragment provides us with the earliest list of NT canonical books. The fragment dates from the 7th or 8th century, but the list it contains dates to c.180. 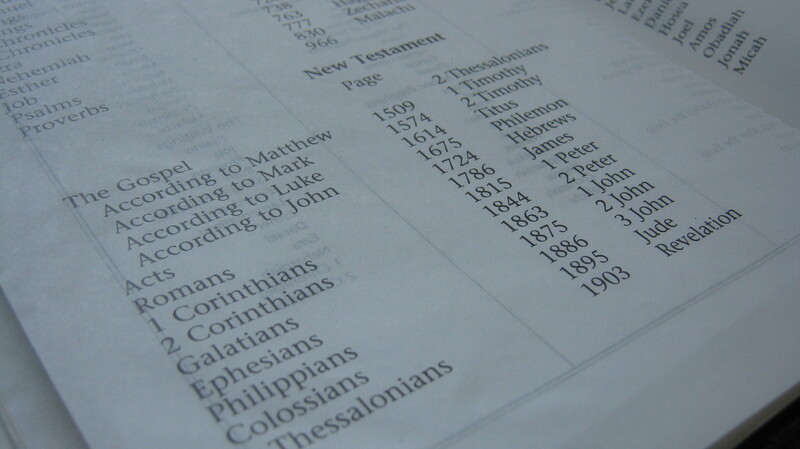 The list establishes the core canon of the early church: the four Gospels, Acts, all 13 epistles of Paul, Jude, 1 John, 2 John (and possibly 3rd John), and Revelation. The Muratorian canon also seems to affirm, but with serious hesitations, the Apocalypse of Peter. The debate over canonical books in the early church only centered around a few books such as 3 John, James, and 2 Peter. The early establishment of the NT canon means that the core doctrines of Christ were confirmed early on by the church. Early Christians rarely referred to these texts as scripture. They were rather using non-canonical text as helpful or clarifying texts in the same way that the works of a modern Christian theologian could be used by your pastor in a sermon. Non-canonical books were cited far, far less frequently than canonical books. Nicea focused on the articulation of the Christian belief about Jesus’ divinity and birthed the Nicean creed. The canon was decided by very broad consensus among the earliest Christians. Some regional councils (Laodicea, Hippo, Carthage) affirmed the NT canon that was already recognized. There were disagreements over a limited number of books in the NT canon that were put forth by a small number of individuals. Origen identifies 2 Peter, 2-3 John, and James as being under dispute. Dionysius of Alexandria reveals that some doubted that Revelation was written by the apostle John and was therefore questionable as scripture. The church eventually did reach a ‘broad, deep, and long-lasting consensus over these books’ and they were accepted into the canon. The books were selected for inclusion into the canon based on authorship (it was written by an apostle); overall church consensus; and the internal qualities of the book. The internal qualities of the canonical books enable the reader to hear the voice of God, be moved by the Holy Spirit, and be transformed by the words he reads. Filed under Apologetics for Parents, Can We Trust The Bible and its Authors?